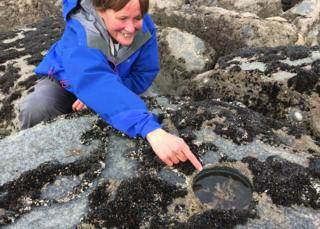 Mini rock pools are being created by scientists trying to protect sea life from the boom in manmade sea defences. Aberystwyth University researchers have drilled holes the size of a family baked bean can into a breakwater made of smooth granite blocks. The blocks had attracted few intertidal creatures. But the new holes were swiftly colonised by fish, anemones and important reef-building honeycomb worms. The scientists hope that the thousands of miles of manmade sea walls under construction to hold back sea levels will incorporate wildlife-friendly features like this. They have also designed an experimental form of concrete, dubbed Reefcrete. The hope is that this material will attract creatures to colonise sea walls. Conventional sea walls are often inhospitable for sea life because they are smooth; they don’t trap water at low tide (unlike a normal rocky shore). They are often also too alkaline. The Reefcrete is made with less cement than usual. It is held together by hemp fibres which act in a similar way to steel re-enforcing bars in buildings. Tests so far have shown that Reefcrete encourages more seaweed to grow than regular sea walls. The seaweed provides a home for a greater variety of animals. Research is continuing to see how the hemp fibres stand up to the test of time. Another form of Reefcrete uses waste shells from a local seafood shelling factory. Discarded shell are classed as waste and must be disposed of in landfill or burned. The scientific team suggests they could be incorporated into sea walls as a binding material instead. The shells would create a rougher surface more suitable for sea life. Whilst the Reefcrete tests continue, the clear success story so far has been the holes in the rocks – a project begun three-and-a-half years ago by a PhD student, Ally Evans. Her supervisor, Dr Pippa Moore, added: “There is a real global issue of governments creating sea defences, sea walls and other coastal infrastructure that are less good for wildlife than the nature they are replacing. “We wanted to see if you changed the complexity and increased the number of habitats on this boulder whether that would increase the number of plants and animals that could survive on it. “It’s definitely worked. What happens is that these rocks are covered at high tide and the little holes trap the water when the sea retreats. It’s incredibly simple – and innovative. Dr Moore has been discussing the findings with the firm proposing the Swansea Bay Tidal Lagoon scheme.